“Thank you very much. It is always flooding here, and every time it rains, water enters the campus, fill up the canals and enter into the classrooms, canteen etc. and into the basketball court. The very recent one was in May 31. Good the rain stopped before water could enter the classrooms and offices; but the mango tree was uprooted and the huge tree fell on the roof of the preschool building. We postponed classes until the roof is repaired. This is because, Cagayan de Oro does not have a sewerage system and developers of subdivision continue to cut down trees and uptown and bulldoze the hills so every time it rains, the city is flooded. The street where OBC is located looks like a river when it floods. Unless OBC will reconstruct its buildings with a higher floor level, much higher than the street level we cannot escape from this problem every year. The Philippines is visited by 26 typhoons every year, and during that season, there is always flooding. For OBC, it is an unending repairs, replacement and spraying against termites. We spray one place, the termites move farther away and come back as soon as the effects of the pesticide is gone. For the termite spraying, it was for the portions of the buildings that are now eaten by termites. The finance office, the quality assurance monitoring office, the two classrooms, the library, the walls of the preschool rooms, the faculty apartments. And then there are furniture and fixtures in the classrooms that are also eaten by termites. These are the teacher’s table, blackboard and book shelves. We will see how much we can buy with the funds that we received now. We thank the Lord that this situation help us to be patient and persevering. This is His Bible College; the Lord will never leave us to suffer for these forever. God is faithful, loving and wise. We praise and thank Him for directing us and providing for our every need as we went through school year 2017-2018. AB Theology regular schedule had an enrolment of 15 for the first semester and 14 for the second semester. The Saturday class for COEMA pastors and workers had an enrolment of 21 for the first semester and 22 for the second semester. Nine (9) students graduated with the degree Bachelor of Arts in Theology on March 23, 2018. The preschool had an enrolment of 36, 2 dropped out, and at the end of the school year 18 graduated to go to Grade One in June 2018. Five (5) regular schedule students took Exegesis of a Gospel summer class under Pastor Reniel Comajeg. Classes were held .from April 2 through April 13, 2018. The summer classes are open to church leaders and pastors who might like to take the courses for audit or credit. The AB Theology graduates were: Pastor Manny Abong from Lugait, Misamis Oriental. He pastors a church affiliated with the Blessed Hope Christian Community Church, International; Aaron Paul A. Badoles, from Faithful Christian Fellowship, Alubijid, Misamis Oriental, Lindly Kent Francisco from Maranatha Bible Church, Cagayan de Oro City – intends to work as associate pastor at Loay, Bohol; Rev. Muriel G. Melchor from Calaanan, Cagayan de Oro and will be pastoring his home church in the same area; Dorem Nebreja from Hinaplanan, Claveria – intends to work as associate pastor at the Calinan Advent Christian Church, Davao City; Rev. Virginito Perino – pastor of Christ Church, Kauswagan, Cagayan de Oro City; Shem Carlo L. Pongcol of Claveria Glorious Advent Christian Church; Pastor Nilo Taray of Blessed Hope Christian Community Church International, Nazareth, Cagayan de Oro City; and Mark David P. Wabe of the El Hanora Church, Divisoria, Cagayan de Oro City. 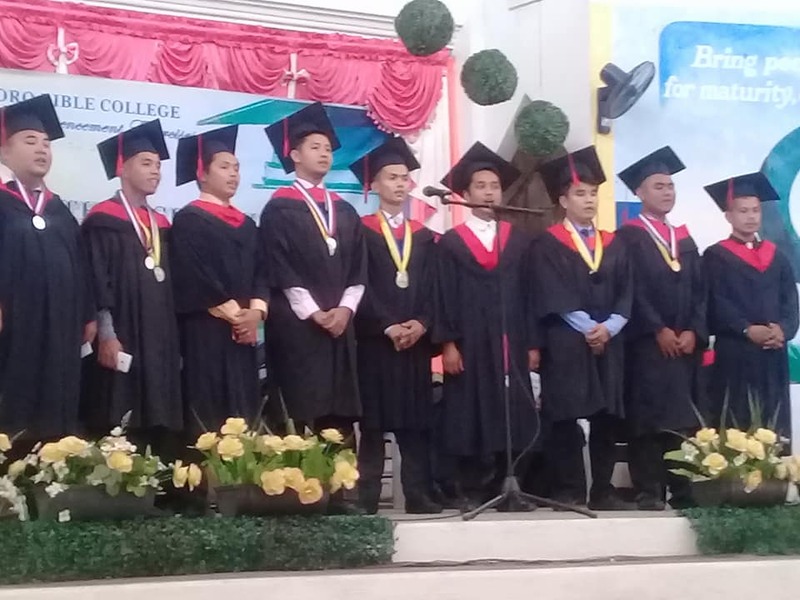 On March 22, 2018 4 students from the regular schedule were commissioned for internship and considered 5 from the COEMA pastors’ special class schedule to be on internship as they pastor in their own church. Rovelito Jr. U. Abecia from Tambobo-an, Claveria Misamis Oriental will have his internship at the New Life Church, Iligan City with Rev. Eleazar M. Comajig as his supervisor and Pastor Billy M. Comahig as his college adviser. Honorio Jr. Dela Llana from Zambales will do his internship at the Lord Jesus Our Redeemer Church, Carmen, Cagayan de Oro City, with Rev. Fernando Relatado as his supervisor and Miss Minda C. Lipanta as his college adviser. Bernardino Jr. Harnaiz from Indahag Christian Fellowship will do his internship at Naburos Advent Christian Church with Pastor John Sarmiento as his supervisor and Pastor Jess P. Gawangon as his college adviser. Nelmer Macarayo of Mount Olive Church, Pangantucan, Bukidnon will do his internship at Loay Advent Christian Church with Pastor ElMark O. Compra as his supervisor and Pastor Reniel M. Comajeg as hi college adviser. These interns will probably be joined for graduation by 5 pastors and church workers who are taking the special schedule classes. Rev. Noel Ayudtud from Lugait; Bernadeth Bagsac of Celebration International; Rev. Cliff Richard Magnase of Blessed Hope Church, Bugo,; Atty. Rev. Felix Saarenas of Blessed Hope Church Community International; and Rev. Carlo Tolomia of an independent Church, Cogon, Cagayan de Oro City. We are expecting to graduate 9 students at the end of school year 2018-2019. The students from the regular class schedule who started their internship on June 11, 2018. Honorio Dela Llana (White polo shirt), Bernardino Harnaiz nelmer Macarayo, and Rovelito Abecia. 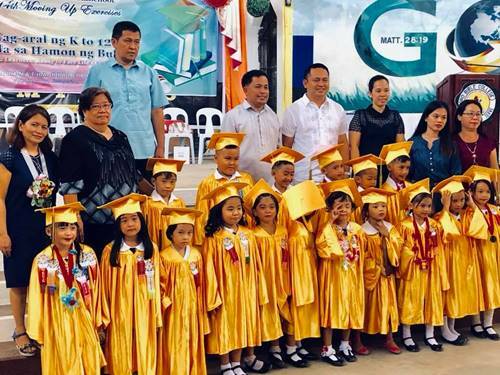 The speaker for the 14th Moving Up Exercises of the Preschool was Pastora Josephine Jesusa Llanesa Rojo of the Jesus Is Alive Community, Cagayan de Oro City. For the 40th Commencement Exercises of the College, the invited speaker was Rev. Bishop Arthur G. Colot of the Blessed Global Christian Fellowship, Kauswagan Cagayan de Oro City. Reverend Nelson Villanueva was the speaker for the Anointing and Commissioning Service held at the Oro Bible College Chapel. Speakers to the aforementioned programs and ceremonies were chosen and recommended by the faculty and staff. Students taking NSTP classes for the school year were all from the Saturday classes. Since they were already pastoring and had their own children’s ministry in their respective churches, Maam Minda required them to report to the NSTP class their won existing ministries. Classes met once a week during the weekdays and lessons taken were from the mandated curriculum from CHED. On Sundays, students goes home to their churches to preach, each and disciple children, youth and adults; leading worship, play music instruments during worship, youth fellowship, prayer meetings, leading small groups, leading home Bible studies and home visitations. NSTP students also joined tree planting and street cleaning as part of their community awareness lessons. Together with students of other colleges and universities in the city, they attend seminars and participate in community outreach activities. Trainings in response to calamity and safety was also conducted in coordination with people contacted to conduct the seminar with the various institutions and industries in the city and region 10. On weekends, second year and third year students went out to the various churches where they were assigned to lead worship, play musical instruments, teach Sunday School to children, youth and adults, lead bible studies, teach and lead young people in the youth groups, preach on Sundays as requested and during prayer meetings when asked; assisted the pastors and leaders of the churches for any ministry they were called upon to help. Some were involved in the community outreach work in their own churches. Most of them were also involved in discipleship ministry. For academic year 2017-2018 interns were able to comply with the requirements for the program of internship in the churches they were assigned to. Pastor Manny Abong was the head of his organization in Lugait, Misamis Oriental. He was involved in community outreach work through the government’s work with the 4Ps and values teaching at the public high school in his town. Aaron Paul A. Badoles was the assistant pastor at the Faithful Christian Fellowship, Alubijid, Misamis Oriental. Paul preached on assignment during Sundays, was in charge of the children and youth classes and discipleship, involved in the children’s ministry in Kalabaylabay, El Salvador City and children’s ministry in Calaanan, Cagayan de Oro City. 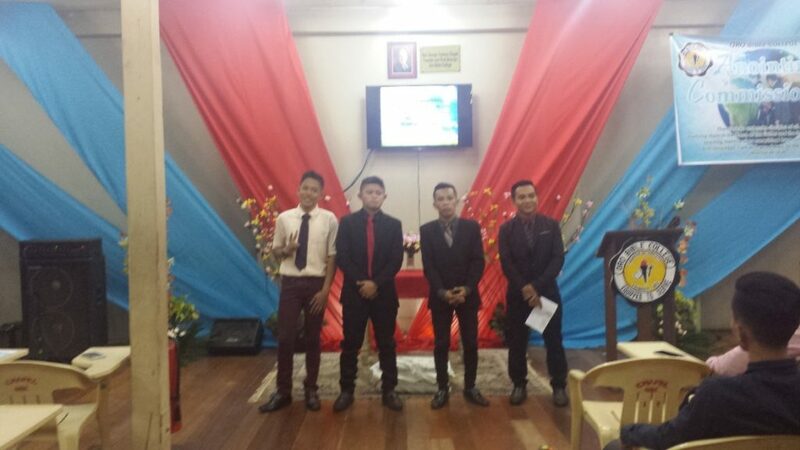 Lindly Kent Francisco and Dorem Nebreja, were assigned to intern at the Calinan Advent Christian Fellowship, Davao City with Pastor Benjie M. Ragas as their supervisor and Pastor Reniel as their college adviser. Both interns assisted in the total church work of their supervisor. Both of them were given the opportunity to preach on Sundays, teach Sunday school, lead prayer meetings, home visitations, lead youth and adult Bible studies, lead the youth group and preached during a funeral, counseled families and preached on special occasions they were required to give an exhortation. They also had the chance to fellowship with ministers and church workers in the area of their internship. Rev. Muriel G. Melchor was already an ordained minister and a practicing Medical Technologist when he enrolled at OBC. He did his internship at his home church in Calaanan, Cagayan de Oro City. His supervisor was Bishop Fabe. He was assigned to preach, lead meetings, play musical instruments during worship, lead and discipled young people, and young professionals and taught adult Bible classes. Rev. Virginito Perino was also an ordained minister when he enrolled at OBC. He also finished his Master of Divinity from a non-CHED recognized seminary in Manila. He was pastoring a reformed church, but later was requested by another group to pastor Christ Church in Kauswagan, Cagayan de Oro. He has a Baptist background and despite being a strong Calvinist, is not a conservative reformed one. He pastored other churches before coming to OBC to get a government recognized degree. Shem Carlo L. Pongcol did his internship at the New Life Church, Iligan City with Reverend Eleazar M. Comajig as his supervisor and Pastor Billy M. Comahig as college adviser. Shem Carlo had the privilege of assisting in the many and varied ministries of the church. He was given the opportunity to preach during Sunday worship services and prayer meetings. He had the chance to teach God’s Word to children, youth and adults. He worked with the kids in the Sunday school extensions of the church, and were able to minister to the Badjao contacts of the church. When his supervisor had surgery, he was tasked to take over most of the work of the Senior Pastor, Rev. Eleazar Comajig, with the guidance and direction of the church leaders. He was able to lead Bible studies, lead worship, played music instruments during worship and taught how to play the drums on weekdays to interested young people, lead the small groups, and do many other services as needed in the church. J. Pallo as his supervisor and Minda Lipanta as College adviser. He had the opportunity to experience pastoral work under the guidance and direction of his supervisor and leaders of the church. After their internship, students came back to the College with their faith strengthened and their commitment to fulltime ministry deepened because of what they experienced in their practicum. They have seen some problems and challenges, but according to them during debrief, these things did not discourage them in finishing their training at OBC. All nine of them were excited to work in the church after graduation. We praise God for all that He has done through the OBC faculty, staff and students for the past school year. We were able to minister to many people in the various churches we went to in our Ministry Skills, student internship and college promotion activities. Promotions Through the holding of an OBC Sunday in local churches, we are able to promote the college. We have pending invitations for the incoming school year from Advent and non-Advent Christian churches. Please pray for us as we go about promoting the college to the local churches in the Region. Our challenges include finances in bringing the whole studentry, faculty and staff to these local churches and the safety of our travels. CHED issued a very strict memo on educational trips for all the higher education institutions in the whole country. We hope through this activity, we are able to challenge the churches of their need for residence training in theology. Lifelong LearnersAccommodation for the pastors and church workers from COEMA and other evangelical churches in the city and province of Misamis Oriental ends on School Year 2017-2018. Those who are already enrolled and have taken courses for the AB Theology program will graduate with the old curriculum. No more new admissions to that program will be allowed by June 2018. Practitioners in the church ministry who desires to earn the degree will have to enroll with the new curriculum with the new GE courses and take the classes on regular schedule. Dr. Nely A. Gamayon – Director, Academic Affairs, Professor to GE and Concentration Courses, teach Counseling and Research to the COEMA special schedule class, teaches Literatures of the World and Humanities and the Arts to regular schedule students during April and May. Repair of Men’s restroom at the Administration building. Repair of Finance Office and the Office occupied by the BPACCI that is destroyed by the termites. Repair of faculty apartments (all 4 doors) eaten by termites. Putting an extension to the wall of the campus facing the Muslim Mosque and houses to prevent their children and young people from climbing over the fence and stop them from throwing rocks, dead animals and dirty diapers to the faculty apartments and basketball area. Faculty workshop conducted in the last Week of March, 2018A faculty workshop and strategic planning was conducted by all the fulltime faculty and staff of the college. Evaluation was conducted on the previous school year, plans and approaches determined for the new school year – 2018-2019 were also determined. A separate workshop was conducted for teaching faculty to finish outcomes-based syllabi required by CHED. OBC Alumni: Alumni officers and members held a welcome party for the new graduates of the AB Theology program. Discussions went underway also for the alumni project of concreting the pavement at the campus entrance up to the boys’ dorm kitchen and meeting with the basketball court. OBC representative, Pastor Billy M. Comahig expressed recommendation to the Alumni officers to raise funds for the replacement and or repair of the ceiling fans at the library.